Harwood’s pseudonymous selves have made literary history, most famously perhaps as Walter Lehmann whose Bulletin acrostic “f*#k” – once deciphered – rocked the Establishment. This collection is the product of diligent research by Harwood scholars Alison Hoddinott and Gregory Kratzmann, both longtime friends of the poet. Their editorial introduction places Gwen Harwood, who died in 1995, among the most formidable literary talents of our age. 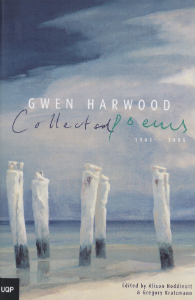 Gwen Harwood (1920–1995), one of the most celebrated voices in modern Australian poetry, was born in 1920 in Brisbane, where she trained as a pianist and organist. After her marriage in 1945 she moved to Hobart, where she lived until her death in 1995. Although she published some poetry in the 1940s and early 1950s, she did not become well known until after the publication of her first book in 1963. Acclaim grew with the appearance of each new volume, and she was awarded a string of literary prizes. Gwen Harwood became an Officer of the Order of Australia in 1989, and was awarded several honorary doctorates. She was an extraordinarily gifted letter writer; indeed some readers of her poetry have come to it because of their enjoyment of Blessed City, edited by Alison Hoddinott (1990). In 2001 UQP published A Steady Stream of Correspondence: Selected Letters of Gwen Harwood 1943–1995, edited by Gregory Kratzmann. Alison Hoddinott was born in Hobart in 1931, and studied at the University of Tasmania and Oxford University. Her publications include Gwen Harwood: The Real and the Imagined World (A&R, 1991). She was formerly a Senior Lecturer at the School of English, Communication and Theatre at University of New England, Armidale. Gregory Kratzmann was born in Toowoomba and undertook his tertiary education at the University of Queensland, the Australian National University and Edinburgh University. He edited A Steady Storm of Correspondence: Selected Letters of Gwen Harwood 1943–1995(UQP, 2001), Gwen Harwood’s New Selected Poems (Penguin Books, 2001) and (with Alison Hoddinott), Gwen Harwood: Collected Poems 1943–1995 (UQP, 2003). He is an Honorary Associate in the School of Humanities and Social Sciences at La Trobe University.